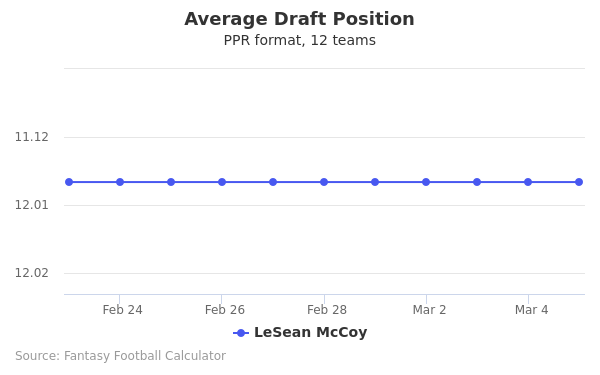 LeSean McCoy's fantasy value is measured by his average draft position (ADP) in fantasy football mock drafts. 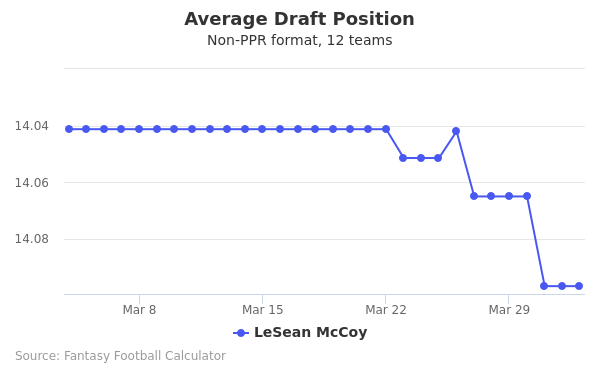 In recent drafts, McCoy's current ADP is 6.10, which indicates that his fantasy outlook is to be the 10th pick of the 6th round, and 69th selection overall. 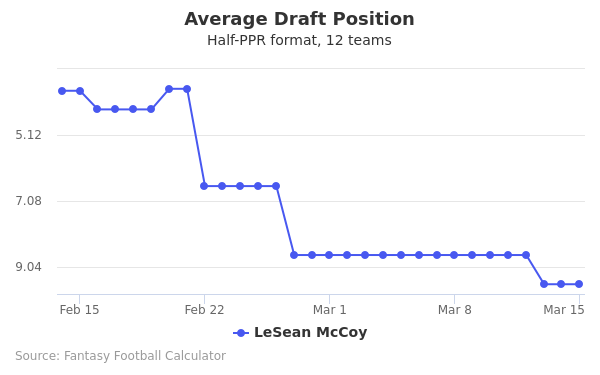 The code below will display a graph that updates every day to show the ADP data for LeSean McCoy for the past 30 days in 12-team PPR leagues. Draft LeSean McCoy or Tyler Lockett? Draft Drew Brees or LeSean McCoy? Draft David Njoku or LeSean McCoy? Draft D.J. Moore or LeSean McCoy? Draft LeSean McCoy or Sammy Watkins? Draft LeSean McCoy or Rashaad Penny? Draft LeSean McCoy or Robby Anderson? Draft Kareem Hunt or LeSean McCoy? Draft Corey Davis or LeSean McCoy? Draft LeSean McCoy or Matt Ryan? Draft LeSean McCoy or Vance McDonald? Draft LeSean McCoy or Philip Rivers? Draft Jerick McKinnon or LeSean McCoy? Draft Carson Wentz or LeSean McCoy? Draft LeSean McCoy or Peyton Barber? Draft Allen Robinson or LeSean McCoy? Draft Chicago Defense or LeSean McCoy? Draft Latavius Murray or LeSean McCoy? Draft Emmanuel Sanders or LeSean McCoy? Draft Jared Goff or LeSean McCoy? Draft Christian Kirk or LeSean McCoy? Draft Josh Jacobs or LeSean McCoy? Draft LeSean McCoy or Royce Freeman? Draft Carlos Hyde or LeSean McCoy? Draft Jared Cook or LeSean McCoy? Start LeSean McCoy or Tyler Lockett? Start Drew Brees or LeSean McCoy? Start David Njoku or LeSean McCoy? Start D.J. 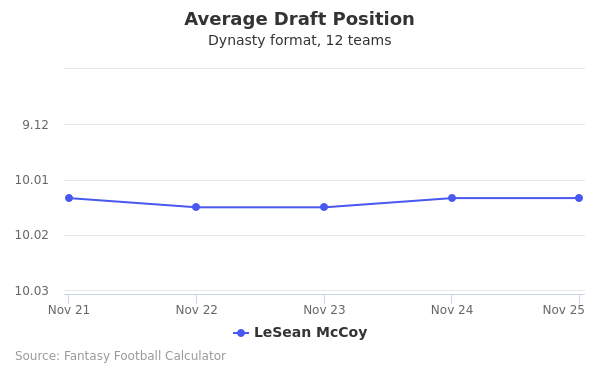 Moore or LeSean McCoy? Start LeSean McCoy or Sammy Watkins? Start LeSean McCoy or Rashaad Penny? Start LeSean McCoy or Robby Anderson? Start Kareem Hunt or LeSean McCoy? Start Corey Davis or LeSean McCoy? Start LeSean McCoy or Matt Ryan? Start LeSean McCoy or Vance McDonald? Start LeSean McCoy or Philip Rivers? Start Jerick McKinnon or LeSean McCoy? Start Carson Wentz or LeSean McCoy? Start LeSean McCoy or Peyton Barber? Start Allen Robinson or LeSean McCoy? Start Chicago Defense or LeSean McCoy? Start Latavius Murray or LeSean McCoy? Start Emmanuel Sanders or LeSean McCoy? Start Jared Goff or LeSean McCoy? Start Christian Kirk or LeSean McCoy? Start Josh Jacobs or LeSean McCoy? Start LeSean McCoy or Royce Freeman? Start Carlos Hyde or LeSean McCoy? Start Jared Cook or LeSean McCoy? 28-year old LeSean McCoy was born and raised in Harrisburg, Pennsylvania. As a child he was nicknamed "Shady" due to experiencing frequent mood swings. He attended Bishop McDevitt High School until 2006. Prior to high school graduation, he suffered an ankle injury that put his athletic career in jeopardy and caused him to transfer to the Milford Academy Prep School. Throughout his high school career McCoy rushed 406 yards in one game during his sophomore year and scored 35 touchdowns his junior year. This led to McCoy earning a Madden Class AAAA from the Associated Press All State. Despite his injury, he went on to attend classes and play football at the University of Pittsburgh. 2007 was his rookie year playing football for the university. He set a record for scoring combine 14 touchdowns that year and rushed for more than 1,300 yards on the field. The next year he was chosen for the All-American as a second team player. Ranked third in the nation in number of rushing touchdowns scored, he had 21 under his belt by season's end. For a look at some amazing runs by McCoy here are some highlights of him going vertical on the field. LeSean McCoy signed a contract and officially made his NFL debut in September of 2009. He was NFL draft pick 53 of round two and received a salary of $3.47 million. During his first NFL season he rushed 637 yards. His success in the first year of his NFL career led to his position as the star running back for the Philadelphia Eagles in his second season. His 40 time rush was the highlight of the season. 2010 was the year McCoy became the Eagle's running back where he broke the 1,000 yard barrier. In 2011 McCoy was crowned the Associated Press's first team All-Pro. Afterwards, McCoy suffered a concussion that kept him out of the majority of the 2012 season's games. Of the games he did play that year he scored his first 2012 touchdown in the game's first quarter, leading to another win for the Eagles. He recovered in 2013 when he had rushed 1,067 yards for the season by the season's 17th week. The same year, he scored a touchdown on the NFL's Monday Night Football, where he achieved 31 carries and rushed 184 yards. As a result, McCoy was honored with Player of the Week from FedEx Grounds. The 2014 season saw McCoy becoming the Eagle's leading rusher. During the off season in 2015 McCoy was sent to play for the Buffalo Bills, whom he signed a five-year contract with. The 2016-207 NFL season has been a highlight in McCoy's career. It started with 16 carries and a total of 58 yards run. McCoy ended 2016 with and invitation to the Pro Bowl for the fifth time. Playing football runs in the McCoy family, as LeSean has a brother who was a wide receiver for the Arizona Cardinals. McCoy lives in New Jersey with his son, LeSean Jr. Fans of McCoy can follow him on twitter @leseanmccoy. He can also be found on Instagram @25_mccoy. He dons jersey number 25 for the Buffalo Bills. For McCoy Jersey sales, click here.